Jen, who custom blends her polish and sells it on Etsy, contacted me about swatching a few of her shades and I was excited to give them a try. 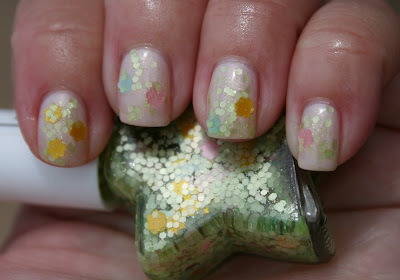 I thought that Sally Hansen Linen would be a great base for Flower Power and it was. Flower Power was a bit thick. I ended up doing two coats of it to try to get better glitter coverage. I did fish a few of the flower glitter out of the neck of the bottle and placed them where I wanted them- I wanted to have at least one on each finger. I topped it with a coat of Gelous before I added NYC Grand Central Station, and it smoothed it out nicely.